Easter is just around the corner. Here's a card that cuts corners - oh, what an awful pun! 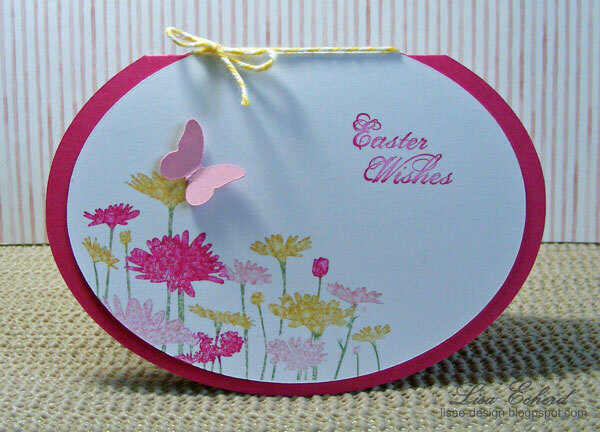 Anyway, I lifted the idea for my oval card from this card at Two Peas in a Bucket by joyfulitl. She used Close to My Heart's Cricut cartridge to cut the shape. This looks like a fantastic cartridge with lots of versatility. I've never ordered anything from CTMH but it looks like they have some very pretty products. I used my SCAL software and my Cricut to come fairly close and add a second layer. For the flowers, I used the Upsy Daisy stamp, markers and a spritz of water before stamping to give that watercolor look. I learned the hard way that one light spritz is all it takes or your flowers look like they have been through a flood. Ingredients: Stamps: Upsy Daisy and All Holidays by Stampin' Up! As I'm working through this latest issue - nerve pain in my legs - I've had some days where I can sit and craft almost normally and some that I still have to stand or walk around in the house. Wednesday was one of those days. So when I put some stamps away and said to myself for the hundreth time, "You really need to get these baskets sorted out," I figured this was a good time. That was a stand up activity right there. 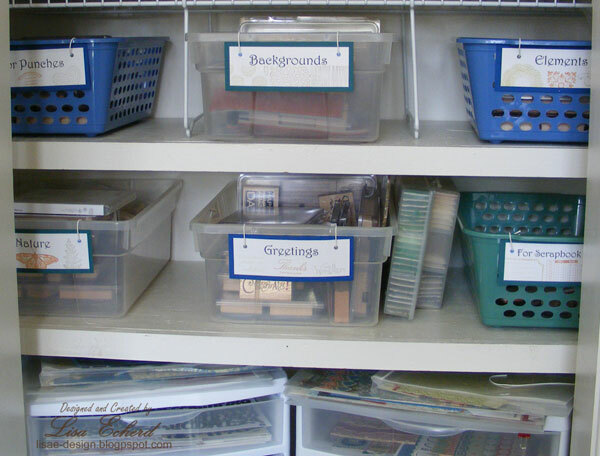 I pulled out all the stamps from these and from 4 more baskets I have in drawers and sorted them. I didn't change the categories I used all that much but did finally get some labels made using stamps from each category. 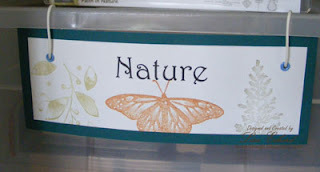 The categories here are: Backgrounds, Elements (flourishes and other designs that aren't a specific thing but embellish a page or card), For Punches (stamps that coordinate with a punch), Nature, Greetings, For Scrapbook Pages (journaling blocks, date stamps, phrases). The stamps in the closet are the ones used the most. In drawers are flowers, holiday, alphas and some cute stamps. So now they are all ready to use again. Thanks for visiting! 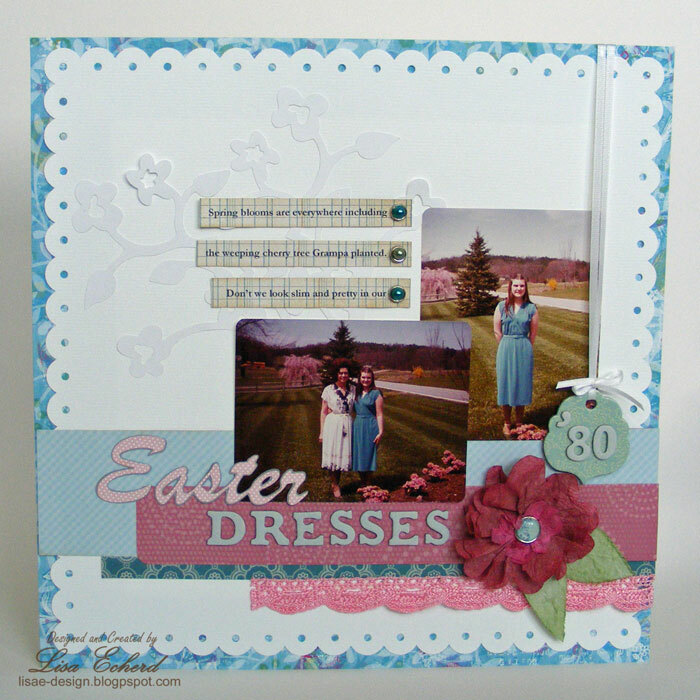 I'll have an Easter card posted this weekend. Hope you have a great Friday. And here comes the first wedding page from my stepdaughter Amanda's. She's been married nearly two years now. I'll probably do these pages a little at a time in with my other pages. This will be the first page for the wedding in our album. I guess it is an unusual choice to do a photo of the father-of-the-bride and the bride rather than the happy couple. Since it is our album, the focus is a little different. I'll have plenty of photos of the happy couple coming along. Speaking of photos, the photographer she used did an amazing job. I do not have her name as I post this but I'll be sure to get it so I can credit her work. I think she was a friend of Amanda's. I don't know if she has gone into wedding photography professionally or not. If you are in the Little Rock area and want a wedding done, I'd be happy to get the name and info and pass it along. She did such unusual angles and all the photos were just stunning. It will be hard to choose which ones to print. Anyway, for the layout I kept this very simple. It may even be my first monochromatic layout ever! Seriously, I love color. The wedding colors were royal blue and teal so I'll get lots of chances to work with colored papers and ribbon, too. The little flowers are petals pulled off a silk geranium stem from Hobby Lobby. 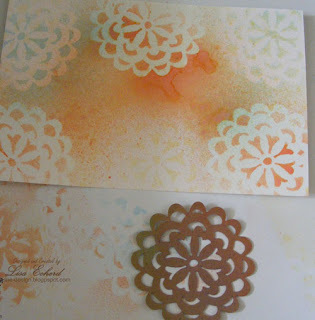 The half pearl centers are from Stampin' Up! as is the designer paper. I'd been saving that paper forever to do some other pages but figured there was plenty to go around. Make all cards the same orientation either portrait or landscape. Keep them flat enough for one postage stamp. While you may know the postage rules or be willing to go the post office with a questionable mailing, others are not so leave the buttons and large brads off. 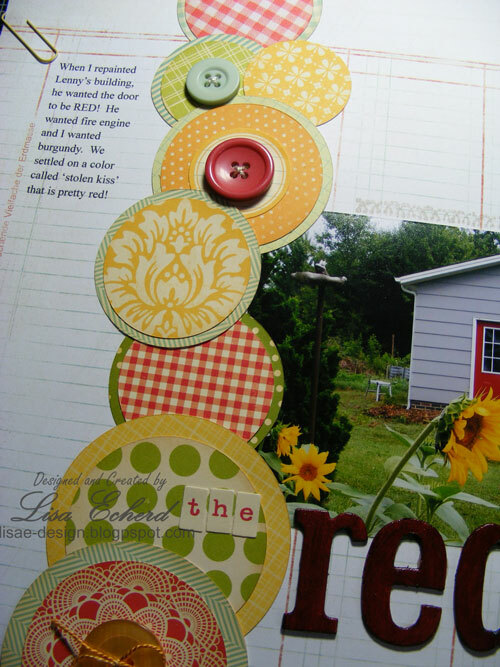 Choose papers and stamps that cross the seasons. 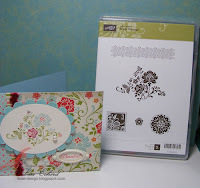 This paper from Stampin' Up! would work anytime of the year. Choose papers from one collection for easy matching. If all papers come from one collection, you can probably use the same color cardstock base. I've given note cards as gift several times. Sometimes I monogram them. 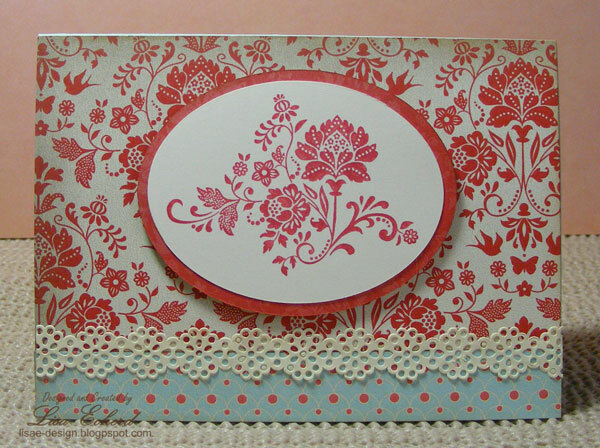 In the second card above, a monogram would fit nicely where the inchie is. 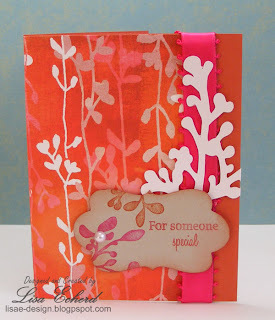 Ingredients: Designer paper: Everyday Enchantment by Stampin' Up! 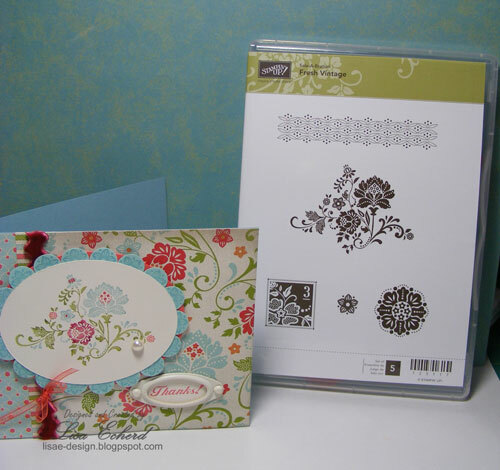 Stamps: Vintage Floral by Stampin' Up! Ribbon: Seam Binding in Baja Breeze by Stampin' Up! Unfortunately, these photos of my mother and I taken some time in my teens were not dated. Practically none of my old photographs have dates on them. So I needed to do a little detective work. It seems obvious that these were photos taken on Easter based on the flowers and that we were all dressed up for church. So I used the flowers and the weather to help me figure out which Easter it was. I finally settled on 1980 because it was clear weather, that Easter date was early enough and I was not yet wearing glasses which I had to get for my driver's license. I'm still not absolutely certain, but it's close. For the page I’m using a lot of my older supplies and I gave the Cricut some exercise which was one of my New Year’s resolutions. 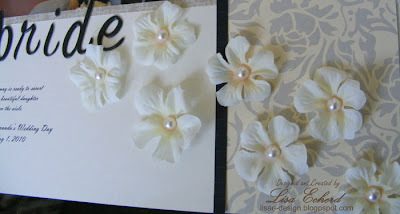 I got the idea for the tone-on-tone white background from this great page over at Sue’s blog. I used the Storybook cartridge to cut the same image twice. One of the cuts is a flipped version of the other. I don't use white that much but I like how it turned out. The Cricut also helped me with my title and my flower. For the flour I cut out a couple of flower designs and used as templates for marking mulberry paper. That old mulberry paper makes a great flower. I still have a few older photos to scrapbook and will probably need some dating tools. What did we do before the Internet to look just about anything up! 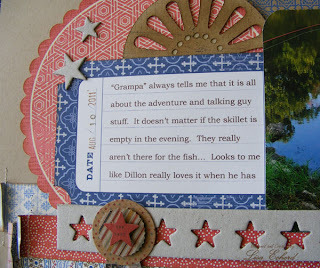 When Lenny visited his grandson last summer, they went fishing almost every day for nearly 2 weeks. They caught 1 fish. Lenny tells me that it isn't about how many fish you catch. It is about the time they spend together on the lake, it is about the process, not the results. Hmm. Dillon sure looks happy with that fish. Anyway, if they enjoy it, that is all that matters. I used the March ArtfulDelight sketch for this layout. 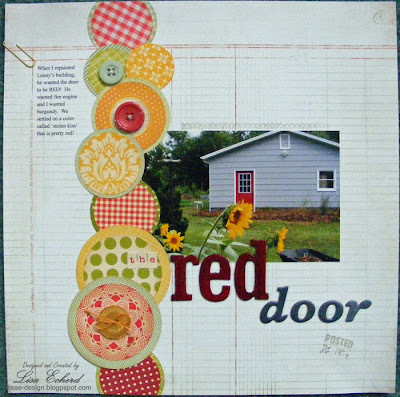 Most of the papers and many of the embellishments are from Little Yellow Bicyle's Saturday collection that I featured in this shopping video post. We all seem to get photographed wearing blues and reds so I wanted some papers to go with those photos. These papers are particularly good for boy pages, too. The chipboard stars have been in my stash forever. I used a negative image for part of the border. For some of the stars, I coated them with Versamark and embossed in gold, copper. One is done in a pewter color which comes from a pigment ink. I made my own flags using some Authentique word stickers and the LYB stick pins. The circular die cut at the top is the one I really used after cutting the slightly too fru-fru one that was used on yesterday's masked card. This was a little more masculine, to me. Finally I cut some of the pattern paper and stitched for the large flag behind the title. 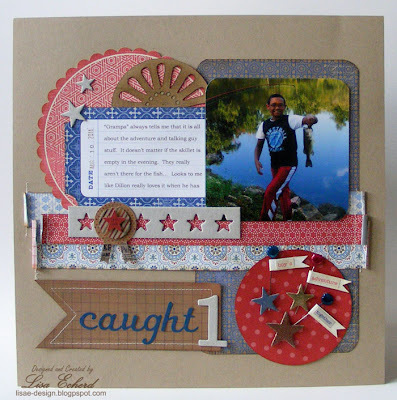 What do you do with die cuts that don't work out for your layout or card? Sometimes I cut things and they aren't quite the right size or shape. Or maybe I don't really like that paper color after all. When doing a layout this weekend, I cut a shape from the Storybook cartridge on my Cricut that I love but not on the layout. I went with something from another cartridge in the end. 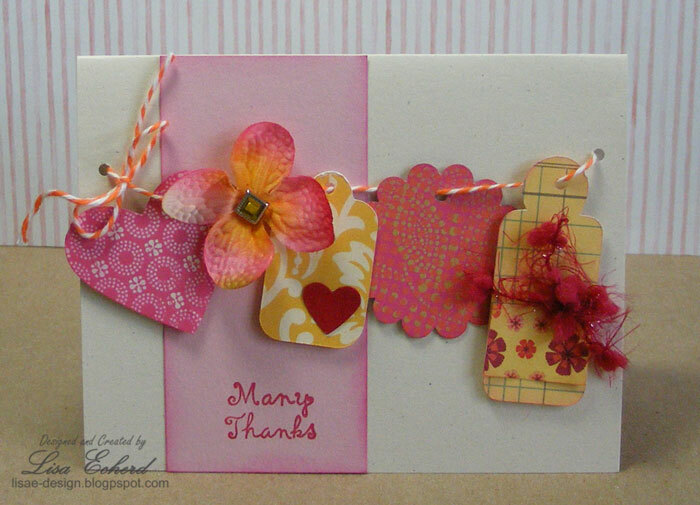 Sometimes these old cuts end up on other cards or layouts. This time, I used it as a mask for misting some card background. Watercolor paper made a great surface for the misted background. 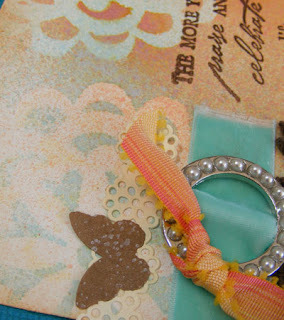 I distressed the edges with some Tea Dye distress ink and then added the sentiment (Cloud 9) and a variety of ribbons. This one is going for my Mother's birthday later in the week. Thanks for stopping by! I'll have a layout up soon and some new cards, too. Here I am using a cute baby as a lure. This is John Thomas, my cousin's grandson and the latest addition to our family. 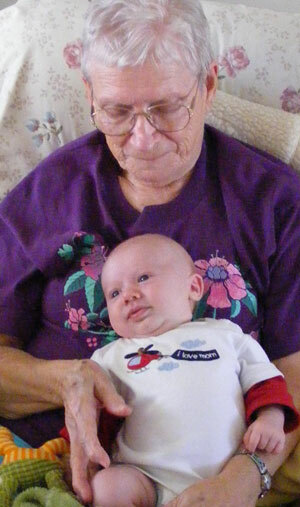 His great grandmother is holding him. We had to wake him up for the photo and I had to take it quick. He went back to sleep as soon as his photo op was over. It was our first chance to meet him as he and his parents live in several hundred miles away. Things are happening in my craft room these days. I just don't have much to share quite yet. We have card class coming up next week and all the cards are complete and cut. One has already been on the blog and I'll get the others up after class. Don't want to spoil the surprise for my ladies. What I'm most working on this week are projects to submit for a design team. I've never tried out for one before so I'm nervous about my projects. I will share them after they are submitted and a decision made on the team. Things are moving at a little slower pace also because I've picked up a new 'pain.' I have a pinched sciatic nerve. I'm not sure of the cause. There are three possible culprits that I know of: the egg crate I added to the bed about a month ago to help me sleep better. It really works with the sleep but I think it has made the bed too soft. My doctor thinks it is my new car :-( Of course my husband and I have considered this and I'm not driving it for a few days to see if things get better. We really like the new van but of course the seat is different; it rides lower to the ground than the old one, etc. It is really easy for me to have bone, joint and muscle issues so this is a possibility. Finally, it could be my arthritis - low back pain is nothing new. I've just never had my left foot go numb before. It is happening a lot when I sit and almost always now when I sit in any vehicle no matter what kind or whether I'm the driver or the passenger. I drove my husband's truck to the doctor a couple of days ago and well, it wasn't good. So one new thing has been added to my craft room - an old work table I used to have in my sewing room when we built the house. When I started the window treatment business, my 8'x10' sewing room was way inadequate as was this table so I moved it to the basement and we built a much bigger work table. This little table has been collecting junk - ah, excuse me, my husband's important pinball paraphernalia. It is the perfect height for a standing work surface; the little skirt even matches my upstairs bedroom. So for awhile it is going to the already crowded craft room/guest bedroom so I can stand and craft at least part of the time. I see a lot of craft room photos on-line where people having standing worktables only. I do this for my window treatments; we'll see how it goes for papercrafts. Not being able to sit very long at a time is a real pain in every way! Next week, I have a regular appointment with my acupuncturist I've been seeing for TMJ and also a physical therapy appointment. One thing I got out of last year's expensive TMJ and muscle strain ordeals were lots of good resources. I'm employing them early in the problem this time round. And I've taken the egg crate off the bed, just in case. Thanks for visiting. Hope to have something crafty to share in a few days. 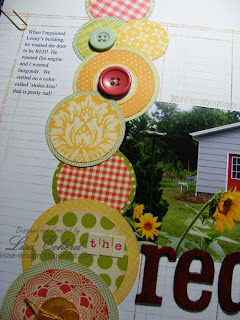 Remember last week's scrapbook sketch with the circles in a row and the photo off to the right. It is in this post. That sketch was also the basis for 5 cards for my February card class. This card is the closest to the scrapbook sketch with a row of 1" punched and inked circles beside the main image which in this case doubled as the greeting. 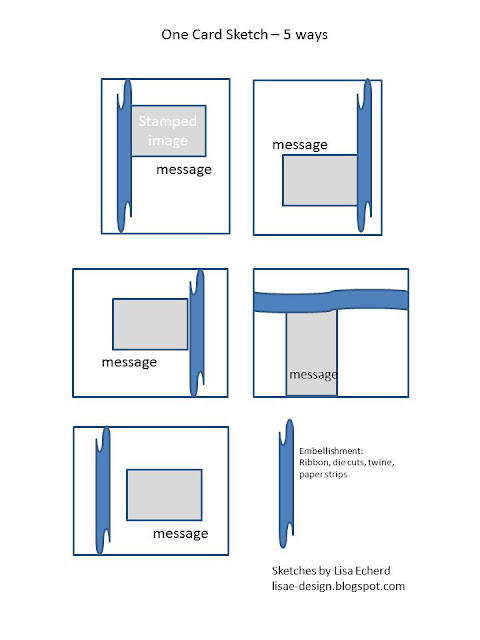 The sketch (2nd row on the left) is flipped left to right and placed in a landscape orientation here. 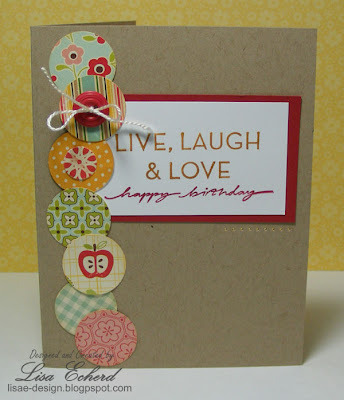 I subbed paper and ribbon strips for the circles. 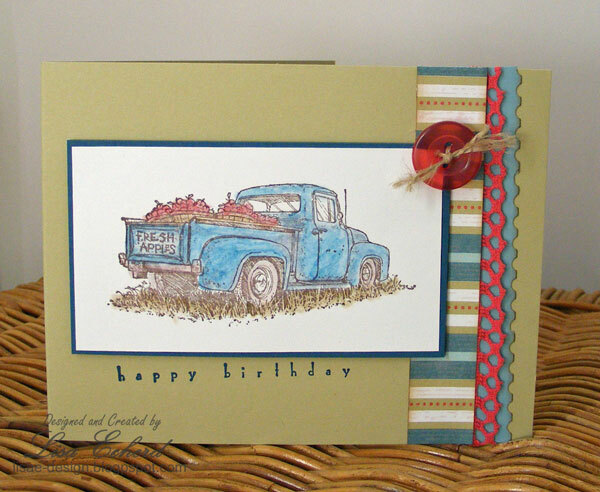 That darling old truck is from Stampin' Up! 's Countryside stamp set. Here is the sketch flipped left to right and then top to bottom with the main image and sentiment on the lower right. In the drawing, it is on the first row, right. I used the Cricut and the Storybook cartridge to cut the branch. I've shown this card before. It also follows the sketch with the tags on a string instead of circles. See more about this card here. Finally, this one may have s-t-r-e-t-c-h-e-d the sketch most of all as it is spread out over a 9" x 4" card which fits into a regular business envelope. (I used some old linen envelopes designed for resumes.) 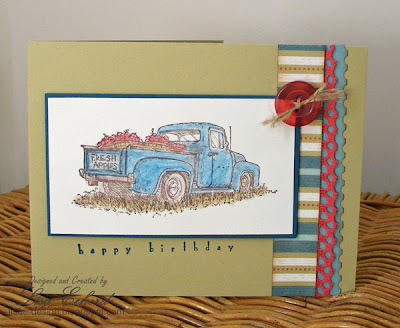 This one gave me a chance to work with the mostly retired Stampin' Up! Bold Brights colors. I've always struggled to put these to use. Thanks for sharing a little of your time with me! 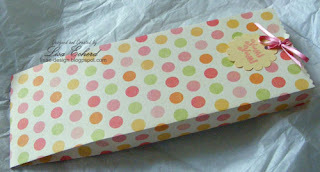 Here are the goodies in my spring Two Peas Order! There wasn't anything from CHA I just felt I had to have when I was watching all the videos and reading blog posts a couple of months ago. One color scheme though that I need a lot is red and blue and I found this with Little Yellow Bicycle in the Saturday collection. Also in the video is washi tape - which is new to me - and the American Crafts roller date stamp. Tomorrow I'll have several cards to post. Hope you have a wonderful day! 1. Use as a background for paper piecing your 'real' background. 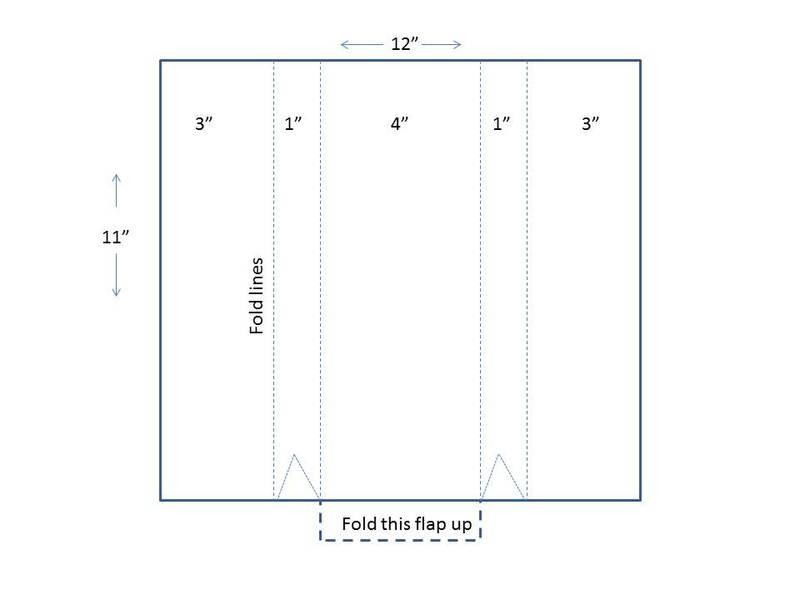 If you are putting together quadrants or strips of pattern paper for your page, use a cast-off sheet for the base. Turn it over to the white side if it isn't printed on both sides for less distraction. Using a base often lets me use less of my really good stuff and stretch it to multiple projects. 2. 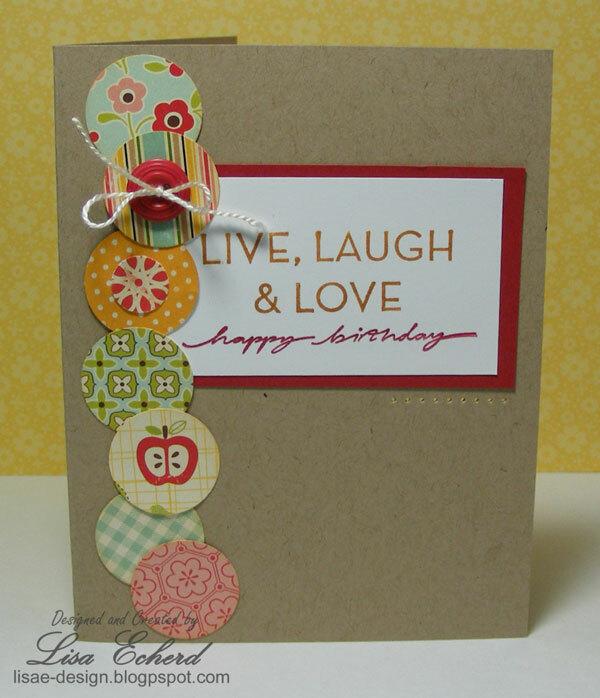 Test out your die cuts. 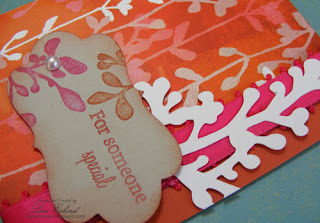 Using the same weight paper can really help determine if the Cricut or other cutter will get you what you really want. 3. 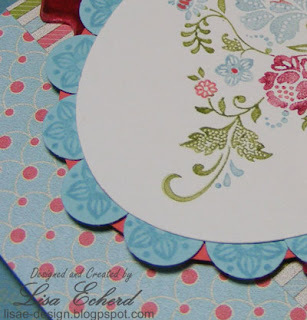 Use old designer paper or cardstock to create masks or templates. 4. Use plainer paper for a test print. I have a wide format printer and often print my journaling right on my background paper. I always do a test print, or 2 or 3 to get the printing where I want it in the right size and color. The white backing of designer paper printed on only one side is perfect. 5. 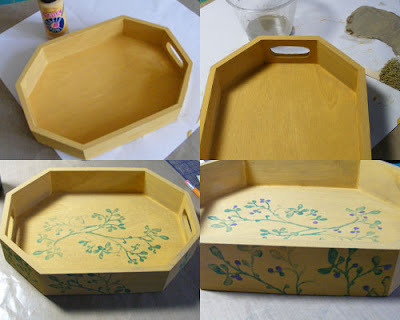 Use as scratch paper for stamping off, painting, misting, etc. This may seem obvious, but I sometimes hesitate to use my designer paper for scratch paper even when I know it won't make it to a scrapbook page. 6. Practice your stitching. 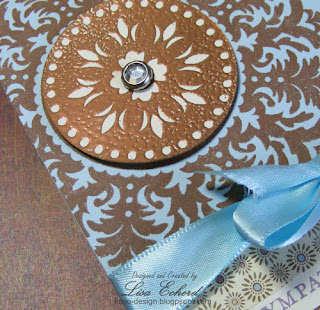 Want to give sewing on your pages a try? Grab some of that awful paper and some thread and practice away! 7. Line an envelope. If the paper has a pleasing print but it is just too flimsy or maybe not a perfect match for a page, it might make a great envelope liner for an extra special delivery. Take a 12x12 piece of designer paper and fold at 4" in from each side and then again at 3" in from each side. With scissors, trim off 1" from one edge all but the middle 4" section. 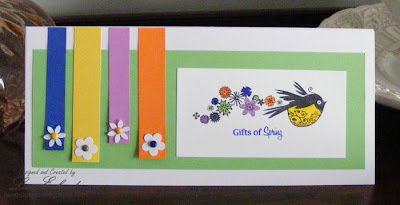 Fold that 4"x1" section up and trim the edge with decorative scissors if desired. Tuck the sides in so that the bottom of the bag is flat. Glue the back one section overlaying the other side and glue the bottom flap up. 9. Cut out a design or some wording from a themed paper. 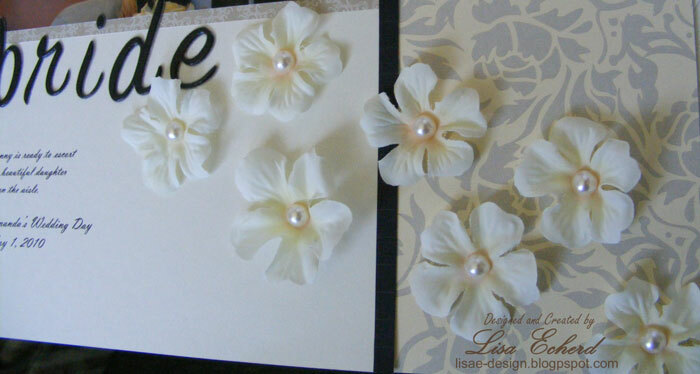 Maybe the paper overall is too busy to work on a page, but small portion may work on a page or a card. 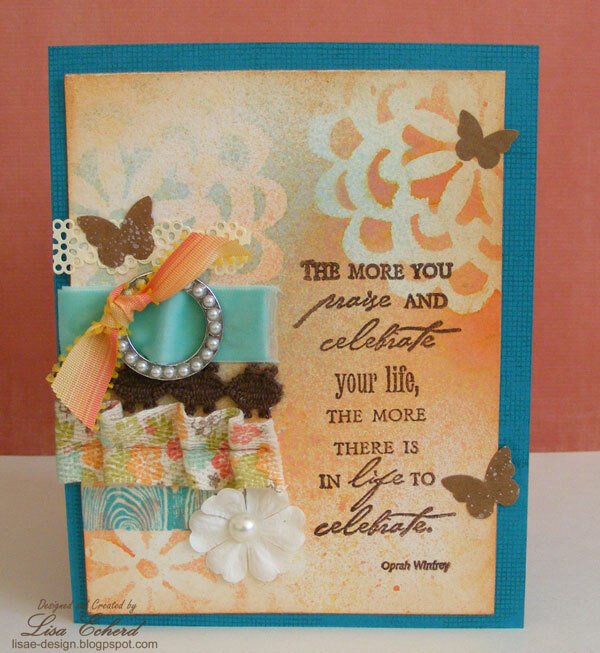 For example "Happy" from Happy Birthday paper could be used for lots of layouts. 10. 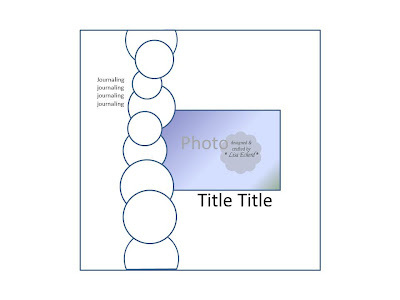 Use as a backdrop for taking photos of completed projects. I have some thin papers with pleasing distressed prints that are great to use as backgrounds for photographing my cards. Of course you can always donate to a school, senior center or other worthy cause if you just want that paper out of your way. Thanks for dropping by! Visit shimelle.com for other 10 Things list for this month. 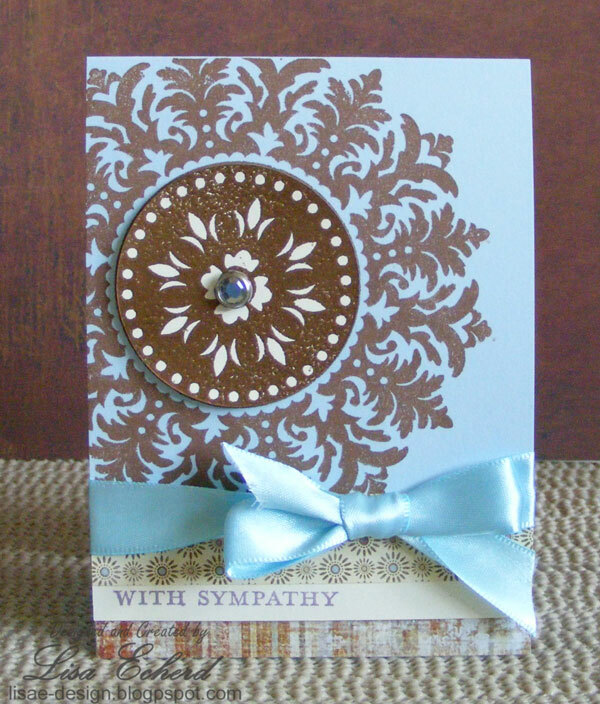 One of the cards requested for our next card class was a sympathy card. I love this card but I'm not sure it is really a good sympathy card. It came out more like a wedding card to me. What I was going for was anything that didn't have a tree on it. 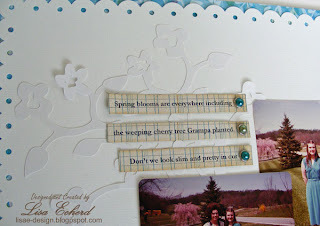 Every time I make a sympathy card, I reach for the trees, tree and nature stamps, that is. They are appropriate, I just wanted a change. So I'll give the ladies the option of using a sympathy message or another greeting. Anyway, we get to use the pretty medallion stamp we haven't exercised in quite a while. It is stamped twice, once in Colorbox Fluid Chalk Chestnut Roan. I chose this ink because it stamps so beautifully every time on any paper. With a large stamp directly on the background that is a plus. The middle is stamped again on cream cardstock in Versamark and embossed with copper powder. Thanks for visiting today! 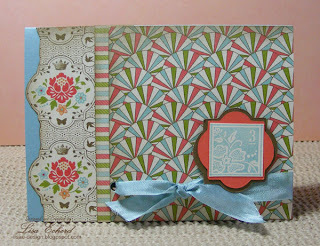 Be sure and drop by again on Saturday as I'll have a '10 Things' post about a favorite topic - designer paper. Oh, and I'm expecting a visit from the mail man soon with a box of treats. Yippee, new stuff ! 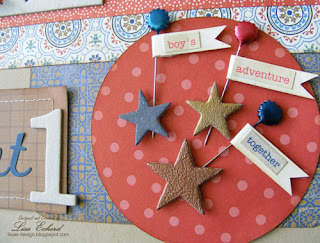 Ingredients: Stamp: Medallion by Stampin' Up! 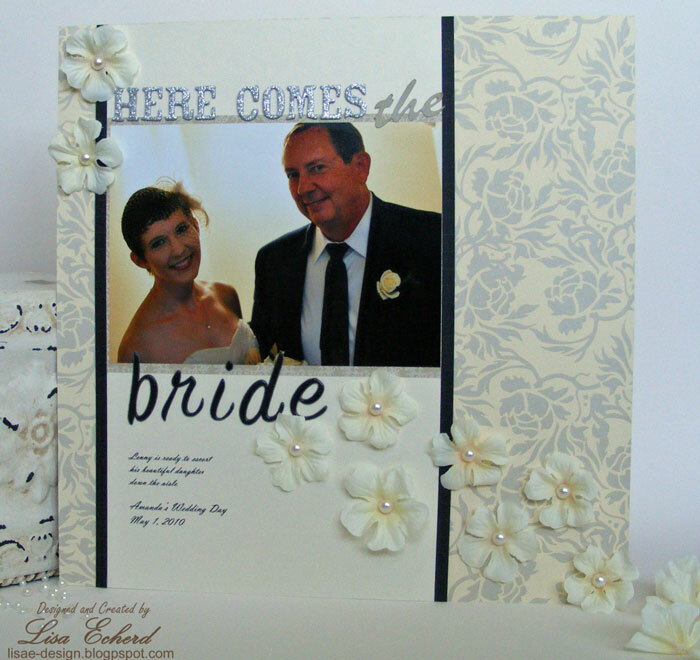 Small paper pads, either 6" square or 8" square, are really popular. 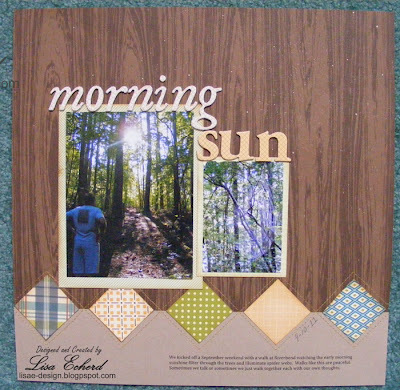 They are fairly inexpensive ways to get all the great patterns from one collection. I did this sketch as a way to use my October Afternoon paper pads on a 12x12 layout. Typically I love to place elements edge to edge. In this case I used circles rather than my traditional paper strips. In the second layout, I cut squares and arranged in this argyle pattern. 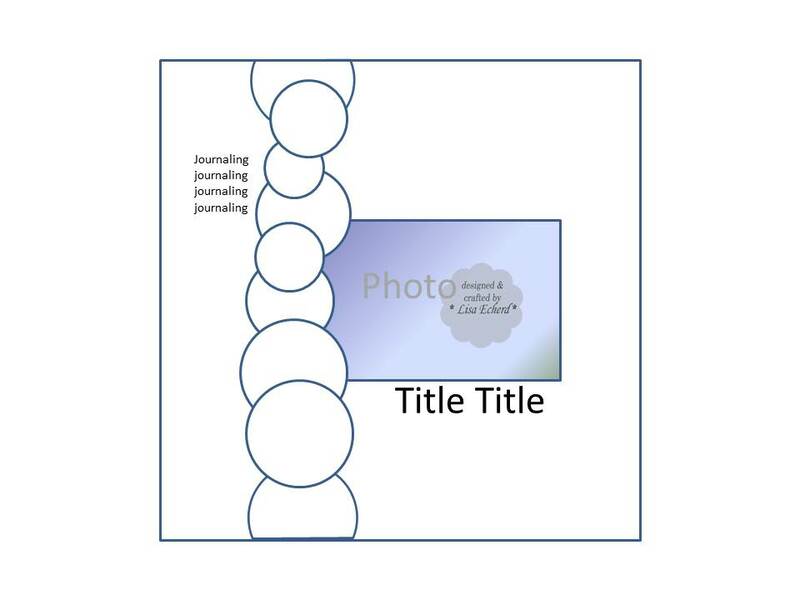 The first video goes through the first layout step-by-step and briefly addresses how to flip the sketch for the second layout. It also shows how to use Creative Memories cutters though you could use any circle cutters. The second video is the stitched argyle pattern. 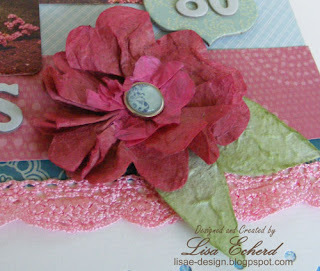 Hope you will grab a mini paper pad or some scraps and join me for an easy layout. If you would like to leave your blog address in the comments, I'd love to see what you have created. Oh, what a timely topic Glitter Girl has at Two Peas this week - scrapbooking 'vintage' photos. Last weekend, I sorted out some of my old family photos and did some prints from ones I'd scanned years ago. Here I am sitting at my grandmother's kitchen table eating of my all time favorite treats, ice cream! Glitter Girl's lesson was on choosing colors complimentary to the typically warm or dark photos from the 70's, 80's and 90's. 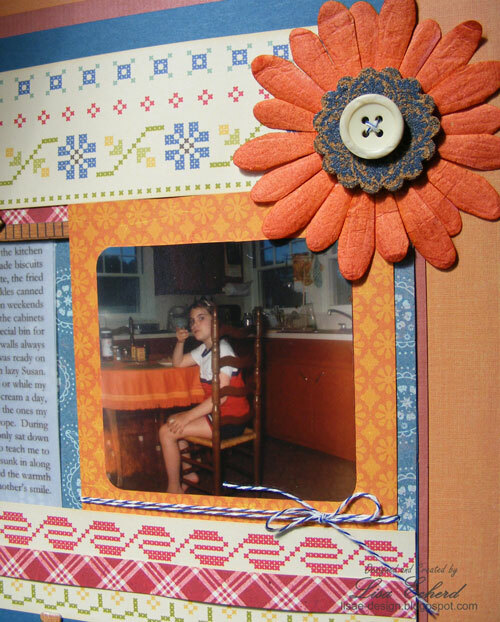 I chose the ivory background October Afternoon papers and lots of warm orange to go with the table cloth and the stained cabinets in the photo. This is a reprint of a 70's photo. I'm not sure where the original is and I don't think I would use it in this case. There is another story to tell with this particular picture so it is likely to get used again anyway. 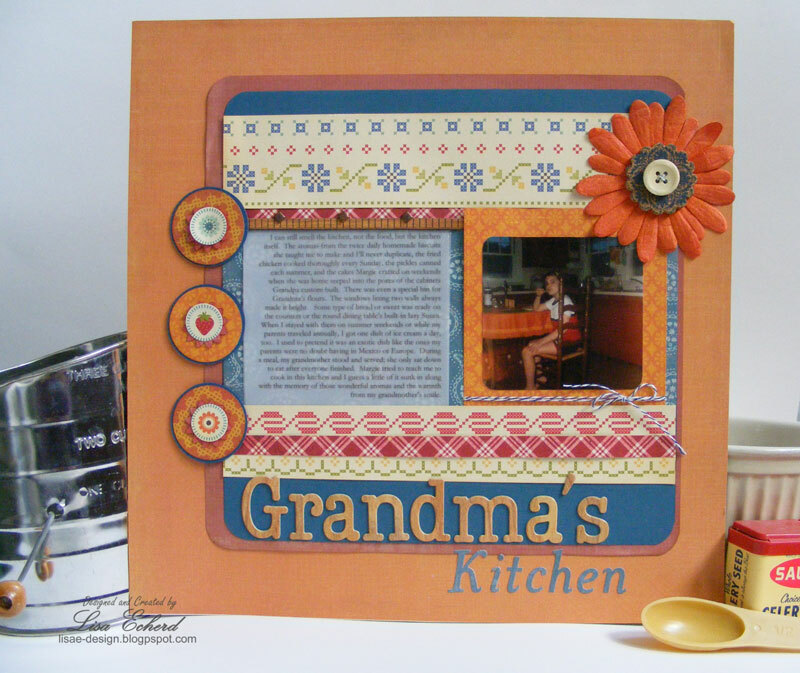 The story today is the memories I have of Grandma's kitchen. She was either in there or her garden just about all the time and something good was usually on the table. I can still smell the kitchen, not the food, but the kitchen itself. The aromas from the twice daily homemade biscuits she taught me to make and I’ll never duplicate, the fried chicken cooked thoroughly every Sunday, the pickles canned each summer, and the cakes Margie crafted on weekends when she was home seeped into the pores of the cabinets Grandpa custom built. There was even a special bin for Grandma’s flours. The windows lining two walls always made it bright. 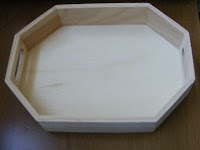 Some type of bread or sweet was ready on the counters or the round dining table’s built-in lazy Susan. When I stayed with them on summer weekends or while my parents traveled annually, I got one dish of ice cream a day, too. I used to pretend it was an exotic dish like the ones my parents were no doubt having in Mexico or Europe. During a meal, my grandmother stood and served; she only sat down to eat after everyone finished. Margie tried to teach me to cook in this kitchen and I guess a little of it sunk in along with the memory of those wonderful aromas and the warmth from my grandmother’s smile. Margie was my mother's oldest sister who patiently tried to teach me to cook and sew. I did learn a few things fortunately that I carried on to my experiments in my own kitchen. I made biscuits for lunch today. They were good but nowhere near Grandma's. 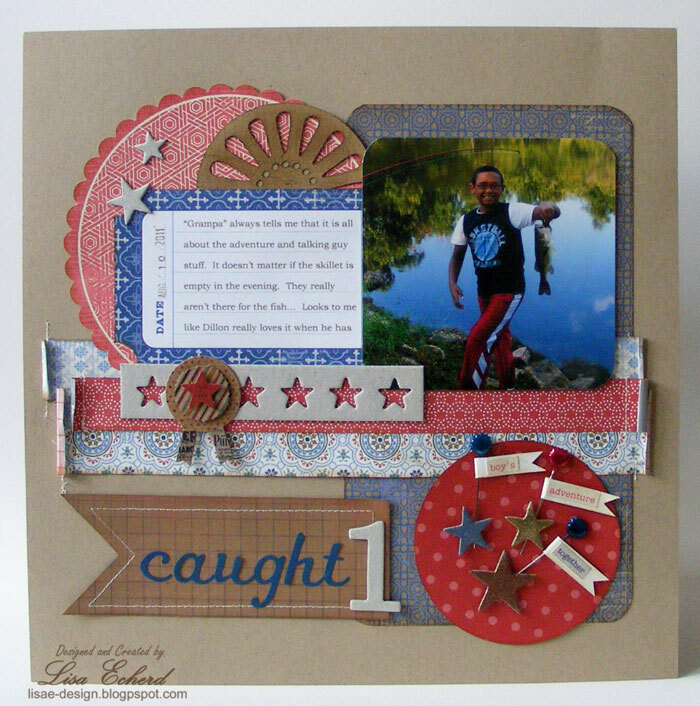 I was tickled to win some more blog candy over at Rainy Day Creations. Susan celebrated her 4 year blog anniversary by giving away 4 stamp sets. I was the last one chosen. First name drawn picked first, second picked from the three remaining stamp sets and so on. It came out so perfectly! 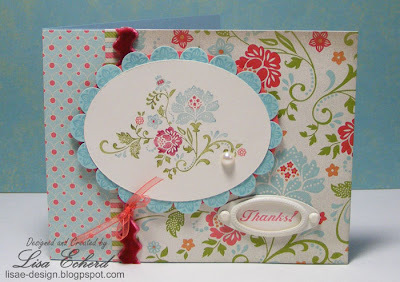 I got the Vintage Floral set which goes with the Stampin' Up! 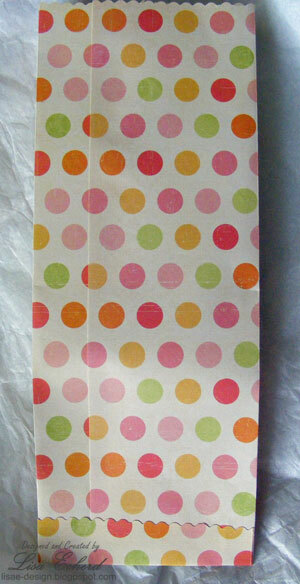 paper I picked for Sale-a-bration! Thank you Susan for the wonderful treat and for your always inspiring blog. For my card, I repeated the smallest stamp on some cardstock and then punched out circles and adhered them to the back of the oval design for a stamped scallop border. 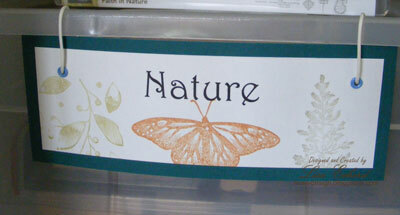 The main stamp was a really pretty design to use markers. To corral the reader glasses my husband uses, I bought this unfinished tray at Hobby Lobby for $1.50 and started painting and stamping. The finished product above will be on the shelf below our phone and answering machine in the spot we sort of lay the glasses in now. I started with some gold acrylic paint that came out a little bold so I sponged on a washed out beige with an old towel, then stamped the vine design by applying paint to my stamp with a sponge. I filled in the areas that didn't stamp well with a brush and added some other color. I'm no artist so it is OK, but no masterpiece. 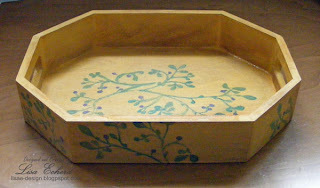 The last step before adding a varnish was to sponge on some distress ink. I was afraid this might smear as distress ink is very water soluable. I was right it did spread out when I brushed on the clear varnish borrowed from my husband. It didn't mess up my tray but it almost messed up the varnish as some of it got back into the can via the brush. Fortunately I was able to clean most of it out. Whew! I almost ruined an $18 can of varnish; that would have certainly put a damper on my thrifty project. 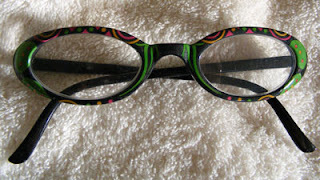 There is another pair like this one that has little blue flowers along the top. He isn't that taken with rhinestones and flowers, but he is taken with a bargain. They do make everyone smile.